Aren’t social media and email more alike than they are different? Both seek to keep your brand top-of-mind with customers and prospects, communicating in a relevant, timely way that ideally is measurable and testable. And that’s the premise behind Flowtown, one of the most exciting new social media tools I’ve seen in months. They also have a nice integration with Klout – the leading service to gauge Twitter influence – automatically including Klout scores for each person. Isn’t that worth the 5 cents per contact that Flowtown charges? 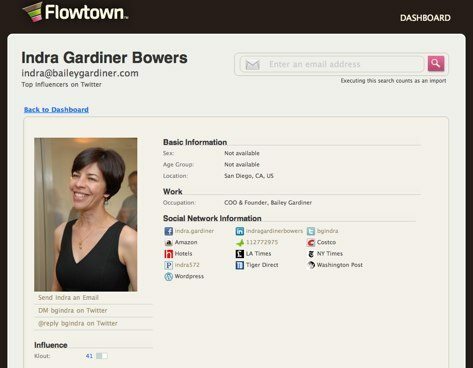 Recognizing that knowing who your customers are, and being able to do something about it are entirely different, Flowtown also has a built-in email component. So, if you want to instantly send an email to only your customers that are on Facebook, inviting them to become fans of your brand there, you can do it in minutes using Flowtown’s existing integration with MailChimp. The fee for up to 75,000 sent emails per month is just $99.97. Unlike enterprise-class social anthropology services like Rapleaf, Flowtown is incredibly easy-to-use, and is tuned for the do-it-yourself marketer. But, the current system is just the beginning. Features being considered for inclusion in new releases include CRM integration; deep analysis of customers’ social graph and content they’ve produced (keyword analysis of your Tweets, for example); and even semi-automated social media response mechanisms. As with any data-harvesting service, Flowtown results aren’t bullet-proof. The more email addresses a person uses across the social Web, the less ideal the results. 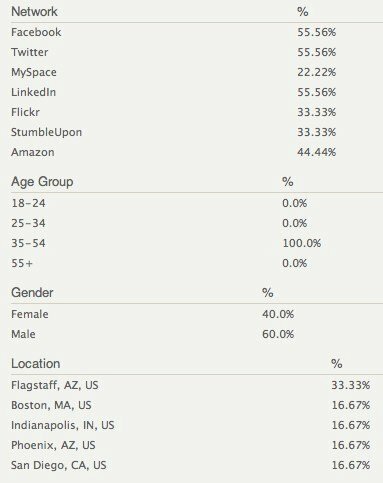 For example, Flowtown’s data on me isn’t particularly accurate, because I use several different email addresses. But, the service goes a long way toward tying email and social media together in a coherent, actionable fashion, and is affordable for almost every company. I’m excited to see what these guys add next. Thanks to my friend (and startup mentoring legend) Francine Hardaway for turning me on to Flowtown – she’s an advisor to the company. If you take Flowtown for a spin (they have a free trial), will you please tell us all how it goes in the comments?